After the successful reburial of the Clarence shipwreck site in Port Phillip Bay in November last year, AHSPP ARC researchers joined lead Partner Organisation the Western Australian Museum (WAM) and their wider staff to rebury the second case study, James Matthews. James Matthews, originally named Voltigeur, was a relatively small French-built wooden brig (~24 m long x 6 m wide x 3 m in depth) that was sold in 1836 to a Brazilian slave dealer. The vessel was subsequently renamed Don Francisco and used in the illegal slave trade between Africa and the West Indies until its capture by the British one year later. During this time, British Parliament had established a Bill to end slavery, and thus seize and destroy any ship transporting slaves. This, however, was not the case for Don Francisco. 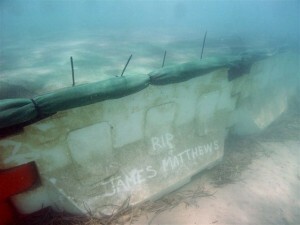 Instead, the vessel was sold as a merchant ship and renamed James Matthews. Unfortunately, on the 22nd of July, 1841, just one day after arriving at the Swan River colony in Fremantle, Western Australia, a storm hit and sank the vessel. This site is not only historically and archaeologically significant for Western Australians, but to date, remains one of the world’s best-preserved examples of a nineteenth-century illegal slaving ship. The site was relocated in the 1970s by avocational archaeologists and thoroughly excavated by WAM over the course of the mid-1970s (Henderson, 1977). After each field season the site was backfilled with surrounding sediment, and remained buried until the late 1990s, when researchers noted exposed timbers from the shipwreck were heavily degraded. It was therefore prudent to determine an in-situ management program to protect the significant site. For thirteen years Vicki Richards and WAM colleagues trialled experimental reburial methods on and near the site. After determining the most efficient management method, and through the use of collaborative funding, WAM and AHSPP put the site to rest. Over the course of 18 – 22 November 2013, 24 people from across the country came to help rebury the once lost, but not forgotten vessel. This included the AHSPP Chief Investigator and Acting Project Manager, staff from the Western Australian Museum’s Materials Conservation and Maritime Archaeology Departments, and practitioners from other AHSPP Partner Organisations (Peter Harvey from Heritage Victoria, Brad Duncan from the NSW Office of Environment and Heritage, Mike Nash from Tasmania Parks and Wildlife Service, and David Steinberg from the Northern Territory Department of Natural Resources). A special thank you to Soon Seok Yang, Cos Coroneos, Danielle Wilkinson, Kurt Bennett, Ian McCann, Rebecca Ryan and Celeste Jordan for volunteering your time and resources to making the reburial of James Matthews possible. Over the course of the 5-day fieldwork, 36 road crash barriers (2 m length; 0.9 m height) were deployed on-site in a semi-elliptical arrangement. Each barrier was anchored in place with a minimum of 120 kg of blue metal, and 20 cubic-metres of clean, washed proprietary sand was dumped within the confines of the cofferdam via a manufactured sand barge. The introduced sediment provided a sterile-base sand layer of approximately 5-15 cm over the entire site. While the ideal reburial for such a site is 0.8 m of sand on-top of the shipwreck, that would equate to dumping 165 cubic-metres of sand in five days, in addition to constructing the cofferdam and taking all of the necessary measurements and sediment samples. Therefore, the deposition of sand into the crash barrier cofferdam will continue in early 2014 until the desired height of 0.8 m is reached. In the meantime, the site has been covered with shade cloth, with the aim of sediment particles from within the water column falling through the shade cloth, onto the site. This is the first time this method for in-situ management has been employed to rebury a shipwreck site anywhere in the world. It is therefore exciting to see the project go from inception to application. We are looking forward to completing the reburial of the site and monitoring its success over the coming years. References: Henderson, G., 1977. Four Seasons of Excavation on the James Matthews Wreck, The First Southern Hemisphere Conference on Maritime Archaeology, Perth, Western Australia.